Koi CBD started back in 2015 when the founders recognized a recurring problem that was becoming all too rampant within the cannabis industry; that due to lack of standardization, it was incredibly difficult to try and find a quality, pure CBD product that would work in the way medical studies claimed it would. They tried and tested dozens of different products, and to them it was inherently clear that the market was “flooded” with substandard products that contained either no CBD at all, or contained amounts that were a far cry from the percentage that was listed on the label. 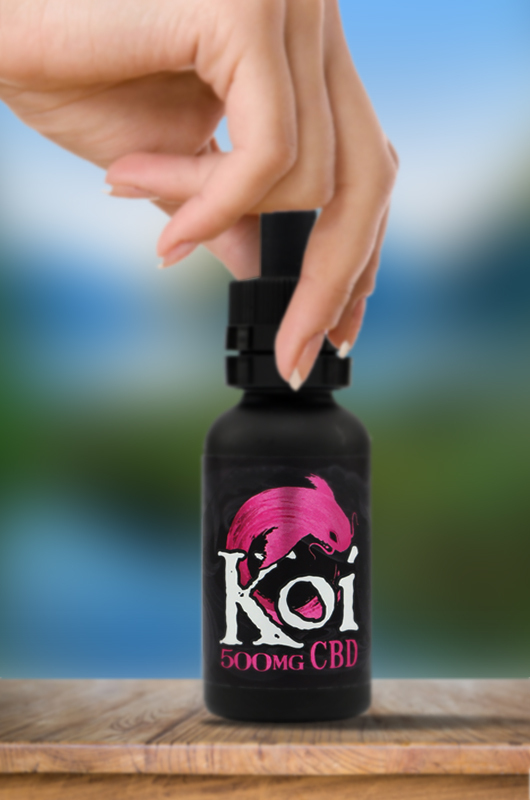 As such, Koi CBD set out with a singular goal in mind: to (as they put it) “help as many people as possible” by manufacturing a CBD extract with full traceability – from the raw material, to the testing laboratory, and all the way to the finished and packaged bottle. We only recently decided to conduct this complete Koi CBD review after trying one of their vape oils (of all things), and after experiencing first hand the quality and potency of the oil, decided to try out some of their edibles and oral CBD tinctures as well. Koi CBD is actually headquartered in the United Kingdom (Hungerford, Berkshire, to be exact), but they have operating offices in southern California between Los Angeles and Anaheim. They source their raw hemp material from organic farms in southern Colorado, where the constant high-elevation sunlight and icy fresh waters of the Rio Grande serve as the perfect naturally-producing hemp environment. After cultivation, the raw CBD hemp material is sent off to a pharmaceutical grade cGMP certified extraction facility, which uses supercritical CO2 methods to produce some of the purest, highest-quality extracts in the industry. Once the CBD extract is in-house, it is then used as the foundation for the entire range of CBD-infused products – from the standard oral CBD oils to the vape liquids, gummies/edibles, and even the pet products. After each batch of individual products is made, they are then sent back out for third-party testing where there are certified for safety, purity, and CBD content. Like we said – one of the only brands in the industry whose process you can trace from start to finish. Of course, their transparency and product traceability is probably the thing that stands out the most to us in terms of what makes Koi CBD a special brand. Aside from that, though, they have developed a truly unique presence in the cannabis industry, and (in our opinion) have some of the best-tasting tinctures and CBD vape liquids on the market. Proprietary CBD vape juices. Again, I’m not a huge vaper but I’ve never experienced better results with a CBD vape juice for general pain relief than I have with Koi’s products. I really like the 500mg Raspberry Dragon Fruit flavor, and just use it in a cheap SMOK TFV4 cartridge with an iStick Power battery, but they’re made to be used universally in any oil/e-liquid vaporizer or vape pen. (Also, you can actually use the CBD vape oils orally as well – see below). 100% THC free. Most top-shelf CBD oils contain at least traces of THC (usually less than 0.3%), but Koi’s tinctures are 100% THC-free, meaning no failed drug tests whatsoever. Vape liquids can be used either orally or in a vaporizer. Like we just mentioned, the Koi CBD Vape Juice can actually be taken under the tongue orally, as well as being used in any vape device. This is perfect for people like myself who actually incorporate both methods into my therapeutic routine, as now I don’t have to go out and spend money on two separate products. Lab results available online under each product description. Even though the majority of high quality CBD companies offer proof of lab testing, it can be hard to get an actual report from them – let alone for each individual product. Koi CBD on the other hand has a link on each one of their product description pages, that takes you directly to the third party lab results. Also, they use SC Labs which is arguably one of the best and most renowned analytics laboratories on the West Coast. Full-spectrum cannabinoids. In addition to the potent amounts of CBD that are present, all full-spectrum Koi CBD oils also contain functional amounts of CBDV and CBG. When all three are combined together, studies have shown that the therapeutic effects are much stronger than when CBD is taken alone as an isolate. Lifetime military veteran discount. If you are a U.S. military veteran, Koi CBD offers a 25% lifetime discount on all their products – that’s an offer that’s truly hard to beat, especially for such high-quality oils. 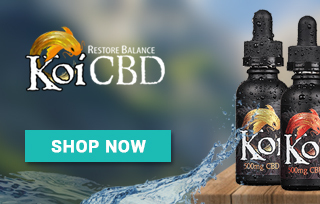 If I could think of one negative aspect about Koi CBD, it would be the fact that it’s kind of confusing to figure out how much of the CBD vape liquid to use in the vaporizer. I was under the assumption that you simply fill up your cartridge full and then start vaping, but this is not really the recommended method. Rather, since the e-liquids are a little more viscous (thicker and more syrupy) than regular vape oils (this is so you can take them orally as well), it’s recommended that you “cut” them with a preferred e-liquid in order to maximizes efficiency. You can use them on your own, but my fear is that the heating coils are not being maximized so in the end you lose a little bit of potency. Like I said earlier, I’ve used the Koi 500mg CBD vape oil to great success for my sporadic migraines. It’s funny because I typically will take a normal oral (under the tongue) CBD oil twice a day every single day, but they are kind of hit or miss when it comes to these severe headaches that pop up. Two or three solid puffs of the portable vaporizer with the 500mg CBD juice, though, and they’re usually gone within 10 minutes. I’ve also used the actual sublingual oils as well, but have mostly been sticking with my 600mg Pure Kana tincture for daily use. If you like to use both oral tinctures and “vape-able” CBD liquids, then honestly the Koi CBD vape oils an amazing option. Koi Naturals Oral CBD Oils: These are the standard sublingual (under the tongue) oils that you take orally – NOT made for vaping devices. They come in four flavors (Lemon Lime, Natural, Orange and Spearmint), two sizes (30mL or 60mL), and three different potencies (250mg, 500mg, or 1,000mg). Koi Naturals CBD Vape Cartridge: This is a 250mg natural hemp flavor vaping cartridge to be used with a 380mAh battery. 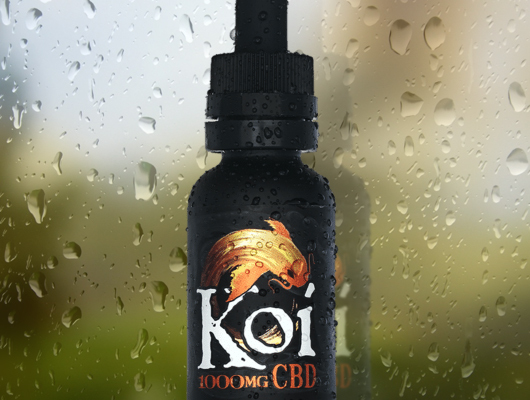 Koi CBD Vape Juice: These are probably the trademark of the Koi CBD lineup; 30mL bottles of potent CBD oil that can be used either as a vape liquid or as an oil tincture. Six flavors available (Blue Raspberry Dragon Fruit, Red Strawberry Milkshake, Gold Vanilla Caramel Custard, White (flavorless), Jade Watermelon Green Apple Sour, Pink Lemonade) in four different potencies (100mg, 250mg, 500mg, or 1,000mg). Also available in a 5-count Koi Variety Pack where you can choose 5 different flavors and mix-n-match them with different potencies. Koi Stik/Koi CBD Pods: This is a super affordable proprietary CBD vape pen that you can buy separate Pods for – choose one of the six different flavors, fill up the Pod with oil, pop it in the Koi Stik, and you’re good to go. Envii Fitt CBD Vaporizer: This is another portable CBD vaporizer option, just a little bit more powerful than the Koi Stik. Comes with re-fillable 3.2mL cartridges for convenience. Koi CBD Soft Chews for Pets: These 100% non-GMO, veterinarian-formulated soft dog treats come in a pack of 25, with eat treat containing roughly 2.5mg of CBD. They are chicken and bacon-flavored, so trying to get your dog to eat them should not be an issue. For small dogs (under 25 lbs) 1-2 treats per day are recommended; medium-sized dogs (25-75 lbs) 2-3 treats per day; and large dogs (70+ lbs) 3-4 treats per day. Koi CBD Tropical Gummies: Unlike most CBD edibles which are simply sprayed topically with a liquid CBD mixture, Koi gummies are actually rolled and mixed directly in with the CBD extract, guaranteeing a consistency in dosage. They come in packs of 20 with 5mg of CBD per gummy, and are available in either natural or sour flavors (packs are mix and matched with lime, tangerine, and acai pomegranate flavors). Lavender Koi CBD Lotion: Containing 200mg of CBD in a 4.25 oz bottle, the Koi Lavender CBD lotion has been used to treat skin conditions like eczema, as well as mild arthritic and muscle conditions for acute pain relief. The lavender and organic aloe and coconut extracts also make it an incredibly soothing cream that can be used all over the hands, body, or face for therapeutic moisturizing. 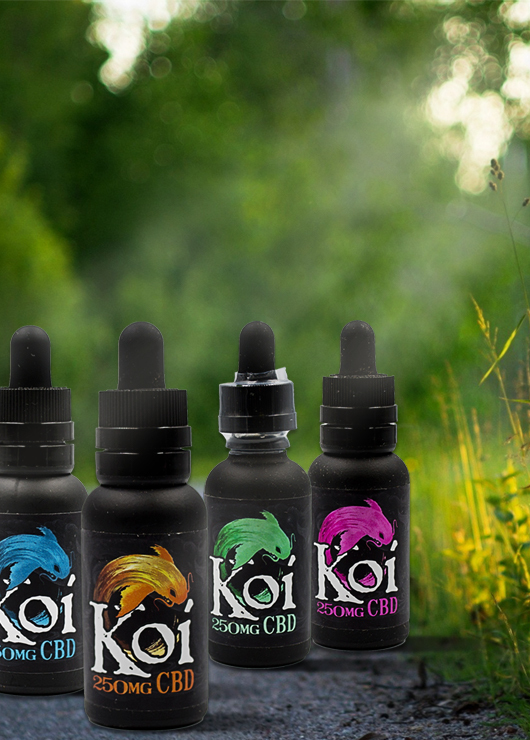 All in all, I would recommend Koi CBD products for people who like to use both CBD vape oils and the traditional oil tinctures. In all honesty if you’ve become accustomed to buying both products separately (as I have over the past two years or so), their CBD vape liquids could potentially save you hundreds of dollars a month. Also, I haven’t had a chance to try them yet but I absolutely love the idea of the CBD dog spray. I’ve used CBD oil for my dogs in the past and let me tell you – it is NO fun trying to get them to eat it. So the thought of being able to spray it right on their food is absolutely brilliant. Will definitely be trying that one in the near future. [You can check out the entire Koi CBD product range by visiting KoiCBD.com – though be advised that some of the vaping products were Out of Stock at the time of writing]. I simply spray Koi Naturals CBD Spray over my dog's food. Giving CBD to my pet has never been so easy and convenient. I’ve never known a company to make such delicious vape flavors. The Red and Jade Koi flavor have got to be up there with the best. My dog goes nuts for the Koi Soft Chews, they must be tasty and I know only quality ingredients are involved in the process. My insomnia was simply killing me. After trying a lot of medicines, one of my friends suggested that i try Koi CBD Oil and after using the product, I've never slept better. One of my favorite products from this website is the Tropical Soft Gummies - the best flavors are lime and pomegranate. Royalty from Ashburn just bough! Fabian from Ashburn just bough! Jessica from Ashburn just bough!